If you're a fan of Wes Anderson movies MiHi knows the best event for you! The Sunset Cinema hosted by the Denver Arts & Venues at the Performing Arts Complex is free and will host three more Wes Anderson Films this summer. The line up is Fantastic Mr. Fox (July 10), Life Aquatic with Steve Zissou (August 14) and The Royal Tenenbaums (August 21). MiHi provides this super cool layout next to your photos so you get to take home your memories from the evening. 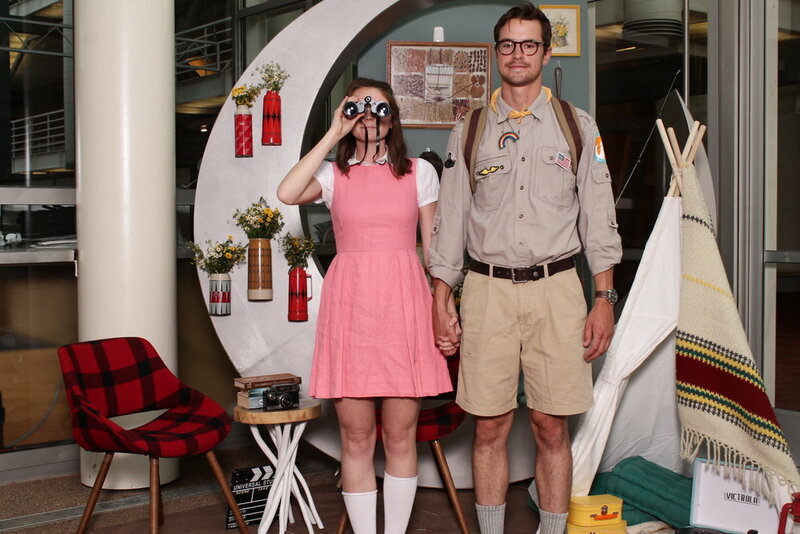 So get dressed up in your Wes Anderson gear (we all know it's the best) and come take some cool pictures! You can print and email your photos so you can take home a copy for your family or your fridge and also post it on social media. Check out the great costumes people put together for this event! If you have a great idea for an event that incorporates your own personal style and props don't hesitate to take advantage of that with our photo booths! You can always choose to provide your own backdrop and decorations that your guests will enjoy. Make sure to head down to the Sunset Cinema for more Wes Anderson Films fun (don't forget to bring your own chair).